It’s safe to say the Address Field is one of the most used features in any browser. It tells you where you are, where you’re going, can act as search field and communicates important security info as you browse. It’s a cornerstone of the modern browser as we know it. And it packs a lot of power. In this post we’re going to take a closer look at the drop-down menu that appears when you start typing in the Address Field, and what options you have for fine-tuning. Hope it helps you discover a few details you never knew you needed! When you start typing, the results listed in the drop-down are attempts by the browser to predict what you’re looking for – a site you’ve visited in the past or something you’ve bookmarked, for example. It’s all about getting you where you want to go quicker. Now, in some browsers, the results in this drop-down are where things can get unclear. The reason why a specific item is listed is often obscured. You’re shown a list of sites or suggested search terms, but little context. What’s more, you can’t distinguish between results determined locally on your machine and ones coming from an external service. In Vivaldi’s Address Field, everything shown in the drop-down is divided into categories. The reasoning here is part usability and part user-empowerment. Vivaldi should show useful results and suggestions when you type in the Address Field. But at the same time, we want you to decide for yourself how this critical part of your browser works. It should be easy for you to distinguish between the bits you like and find useful, the bits you don’t, and which suggestions (if any) are coming from external sources. What is shown in the drop-down? For many, Bookmarks are an important tool in managing online life. The way people use them is individual, of course. 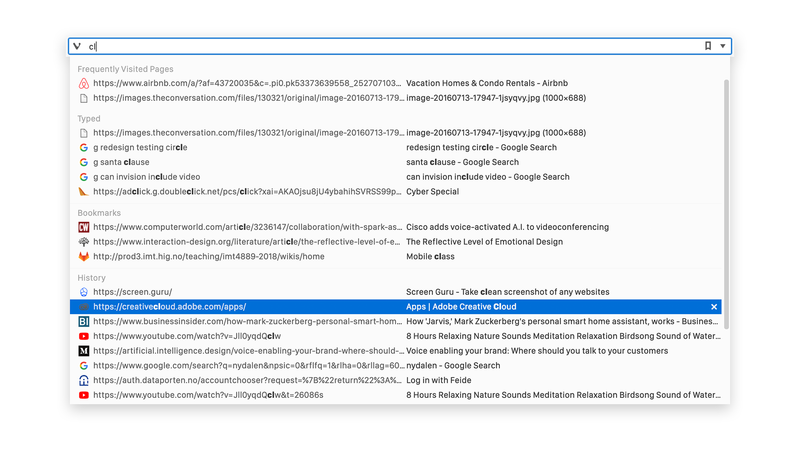 Some of you might use Bookmarks to carefully curate a database of your most-loved sites and services. For others, they’re a revolving door of interesting pages that they want to come back to later. In either case, if you use them, Bookmarks are a fundamental part of the experience and often the first port of call when trying to get somewhere on the web. Your Typed History is a list of search terms and addresses you’ve typed into the Address Field. This list is stored locally on your machine. These items might be useful to include in the drop-down results if you often find yourself manually entering a site’s URL or trying to track down a previous search. To many people the usefulness of their browsing history can be an afterthought. But depending on your browsing habits, it can be a critical piece of the puzzle in how you get around. If you tend to keep your browsing history tucked away, hidden or otherwise ignored, consider if it could be put to work for you in the Address Field. It might just make your browsing more efficient. The Web is an enormous world of endless possibility. So you might be surprised to hear that the average user visits just 30 unique pages every day. And how many of those pages would you guess are unique across, say, a week? I’d venture to say that many of us find ourselves coming back to the same set of sites more often than we think. A recent addition to the Address Field Drop-Down, results listed under Frequently Visited Sites are generated from your browsing history and make it quicker to get back to your regular destinations. Search Suggestions can be an effective way to help you search from the Address Field. As the name implies, when you start typing, your search engine of choice will provide a list of suggested search terms in the drop-down. There are some privacy implications to be aware of here though. With Search Suggestions enabled, everything you type is sent to the search engine whether or not you perform the search. Check out our deep dive on Search Suggestions for more details and how you can tweak things to better protect your privacy. In the Address Field you can choose to allow Search Suggestions from any selected search engine; limit it to cases where you use a search engine nickname (e.g. “d ” for DuckDuckGo); or, not show them at all. You can even disable the Search Suggestion functionality per search engine by deleting the Suggest URL for specific engines under Settings→ Search. Or, get creative and use the Suggest URL from a trusted source for another engine altogether (!). There’s a lot of fine-grained control here that’s worth exploring. In later posts we’ll take a closer look at other key behaviours and features in the Address Bar. From enabling Reader Mode to how to use the Site Info pane – there’s just too much to pack into a single guide! We love to hear about the functionality you’re after in the browser. 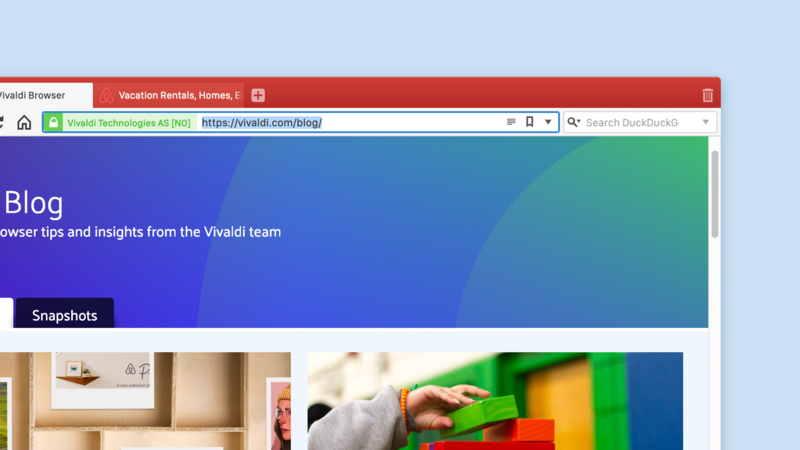 If you’ve got a dream feature that you’d like to see in Vivaldi, let us know by submitting a Feature Request.